We've pulled together a list of common behavioral interview questions. One of the keys to success in interviewing is practice, so we encourage you to take the time to work out answers to these questions using one of the suggested methods, such as the STAR approach. For more tips, read our article, Behavioral Interviewing Strategies.
? 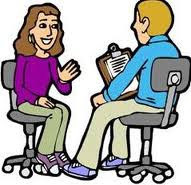 Then go to our Job Interview Questions Database, where we have traditional, behavioral, and mixed interview questions for both experienced job-seekers and college students and recent grads. • Tell me about a recent situation in which you had to deal with a very upset customer or co-worker.